The dark and sultry clerodendrum quadriloculare explodes into bright beauty each spring with an incredible display of gorgeous flowers. This plant, with its tongue twister of a name, is also sometimes referred to as Starburst or Shooting Star. Leaves of dusty gray-green are backed with deep purple. 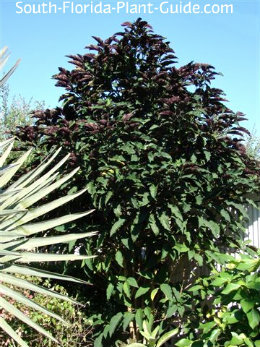 This gives the shrub a deep-toned hue that contrasts with all the green in a landscape. And then, with the advent of spring, the plant produces huge flower clusters like showers of fireworks that turn it from handsome backdrop scenery into the star of the show. 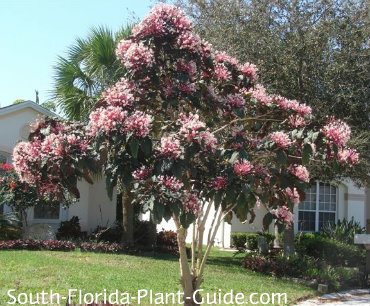 This is one of the most spectacular South Florida flowering plants - and even though the blooms decorate it only in late winter or early spring, the fantastic floral display is well worth the wait. You can keep it trimmed to shrub form or use it as a small tree. It'll grow tree-like on its own with multiple lower branches...or you can buy a standard trained to a single trunk from the nursery. Big, impressive and showy, these spring flowering shrubs are meant for the true gardener - or at least the adventurous one - who can deal with root runners, the shoots that pop up nearby from the mama plant's roots. 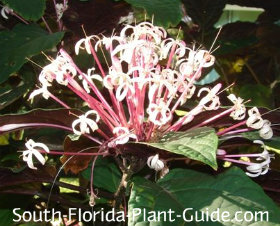 Clerodendrum quadriloculare is a fast grower for sun to partial shade. It does well in a dappled sun area and will flower more heavily on the side of the plant that gets the most light. You can keep it about 8 to 10 feet in tree or shrub form, or let it get larger if you prefer (it can get 15 feet or more). Grow clerodendrum quadriloculare in Zone 10. In Zone 9B you can use it as a container plant that you can bring in during winter cold snaps. 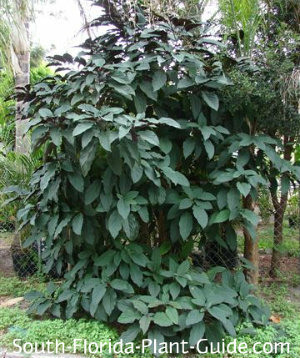 Remove root runners as soon as you see them, unless you want a forest of clerodendrum quadriloculare. A pruning or two a year should help keep clerodendrum bushy and full. The plant can look shabby after a cold winter but will flush out again in spring. Do a hard pruning after the spring bloom, if you like, to keep the size in check and encourage full lush growth. You can cut it back again in fall (before October) as well if it needs it. Fertilize 3 times a year - in spring, summer, and autumn - with a good granular fertilizer. You can supplement feedings with bone meal to promote heavier spring bloom. 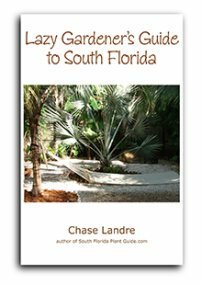 Place these shrubs 4 feet or more apart. Wherever you plant it, leave enough room for you to get around the plant to remove root runners. Do this while they're small so you can just pull them out rather than having to dig. In some cases you might be able to just mow over them. Come out from the house 4 to 5 feet so the mature plant clears roof eaves. Come in from a walk or drive 4 to 6 feet. These shrubs will grow in large containers. 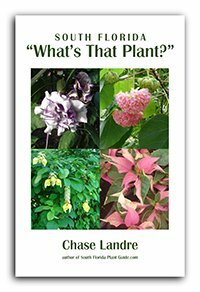 COMPANION PLANT SUGGESTIONS: In a part sun or part shade location try pairing with hope philodendron, variegated arboricola, tibouchina, cape jasmine, Indian hawthorne, cat's whiskers, blackberry iris, and angel's trumpet.